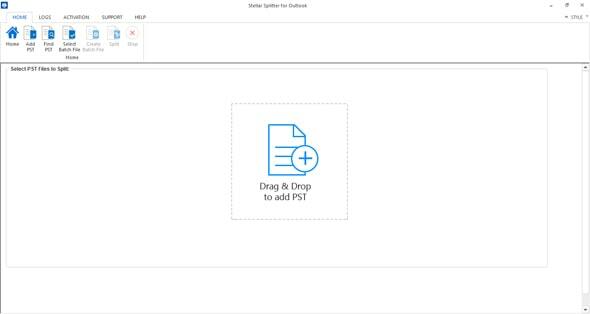 Splits large sized Outlook PST files into smaller manageable PST files. 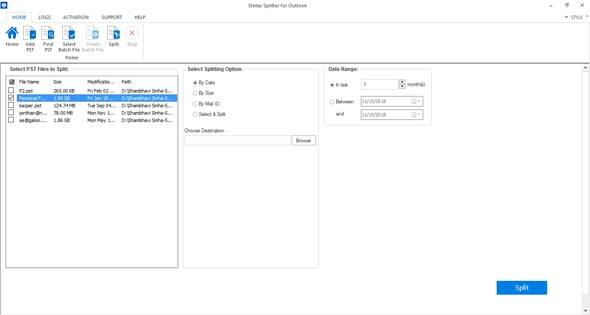 Helps splitting PST files on the basis of chosen split criteria: Date, Size, Email ID etc. * Free Demo offers only two splitting options, i.e. 'By Size' and 'Select and Split’ with limitations. In some Outlook versions, maximum permissible PST size limit is only 2 GB. Sometimes, the PST becomes corrupt by growing even beyond 2 GB. Stellar PST splitter can be helpful in avoiding such instances of PST corruption or inaccessibility by splitting large sized PST files into manageable PST files. This utility inherits the concept of multi-tasking. It carries out splitting of multiple PST files/folders in a single operation, based on the selected split criteria. 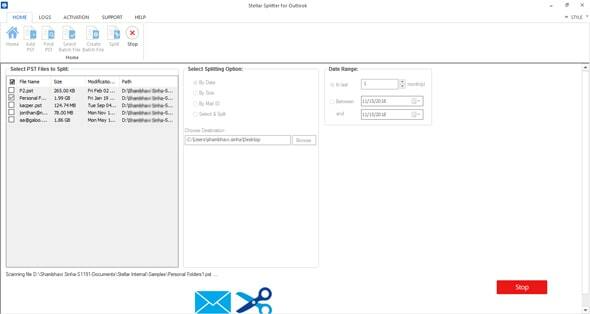 Multiple options to split oversized PST file include on the basis of 'Date', 'PST Size', 'Mail ID' and 'Folders'. Provides options to create a batch file and save the preferences for splitting PST files. This batch file can be run to split multiple files on the basis of a predefined split criterion automatically. PST Splitter can pick PST files from different locations, including the network attached hard memory devices and carry out the splitting operation as usual. This PST splitter utility is completely read-only in its operations and keeps original formatting of HTML and RTF messages absolutely intact. Moreover, the software does not make any change to the original PST file and just splits it into two different files. Creates and maintains a log report, containing details of each and every operation with the splitter software for future reference. It helps to achieve the lost speed & performance of Outlook again. PST splitter considers several areas like mailbox, folders to archive PST file data in minimal size. 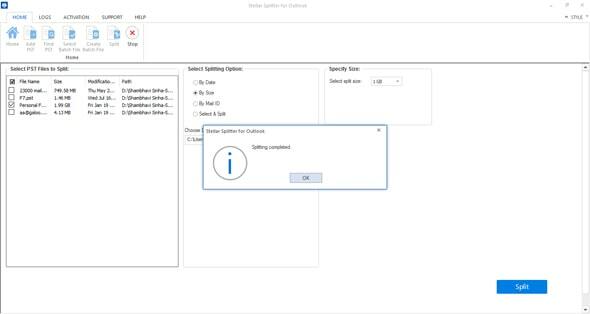 Que: Why there is a need to split an Outlook .pst file into multiple files? Answer: As, Outlook stores all the mails and other email components in a .pst file, gradually the size of the .pst file grows. In general, the PST file has a maximum permissible size limit. In MS Outlook 2002 and previous versions, the maximum suggested PST size limit is 2 GB. In case of Outlook 2007 and 2003, the size limit is 20 GB, whereas in 2010, it can be increased up to 50 GB. However, at times, the size of PST file grows even 50 GB, leading to corruption of the PST file and inaccessibility of the mails in it. Moreover, with a large Outlook PST file, normal operations like sending/opening/archiving mails become slow. 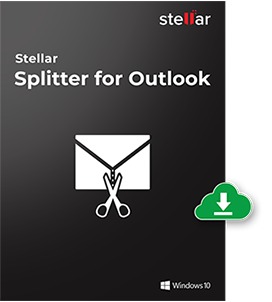 In order to avoid all such situations, you need to split your large Outlook .pst file into usable multiple .pst files using Stellar PST Splitter. I was not feeling well with traditional archive process in MS Outlook which includes risk to lose my important emails. This software had fulfilled splitting operations without hampering data integrity of original file. After endless demonstrations, I successfully found a utility that truly served my needs.